Plans for the Saudi Aramco IPO are full steam ahead, and the offering is already being considered a once-in-a-generation deal. Formally known as the Saudi Arabian Oil Co., Saudi Aramco is the kingdom's government-owned oil titan. News of the Saudi Aramco initial public offering first broke back in January when The Economist reported Saudi Arabia was considering selling a small stake to the public. Back in April, Deputy Crown Prince Mohammad bin Salman confirmed the deal will happen in 2017 as part of his long-term economic overhaul. Since then, worldwide anticipation has been building for what will surely be the biggest IPO in history. 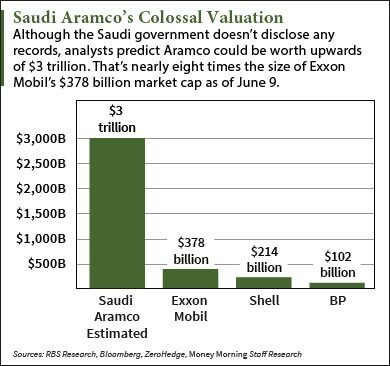 Saudi Aramco has undoubtedly the highest valuation of any company in the world. According to the country's government, Saudi Aramco could be worth between 7.50 trillion and 11.25 trillion Saudi riyals (or $2 trillion and $3 trillion). Even the low end of that range is nearly twice as much as all seven Big Oil companies combined. The kingdom is reportedly looking to sell around 5% of the company. That would be worth anywhere from $100 billion to $150 billion. By comparison, the Alibaba IPO, which was previously the world's largest IPO, raised only $21.8 billion. Once Saudi Aramco goes public, the IPO underwriters could generate $1 billion in fees due to the deal's estimated proceeds of up to $150 billion. Money Morning Global Energy Strategist Dr. Kent Moors says the country's plans to sell 5% of the company will be unlike anything the kingdom has done before. "The offering signals a huge change in Saudi Arabia's strategy," Moors – a veteran of the oil industry with 40 years of experience advising Russian and U.S. agencies – said in April. "The nation has been reluctant to offer parts of its crown jewel oil company, because doing so will require disclosing information about Saudi Arabia's oil fields that have been kept under wraps until now." One of the most important things about Saudi Aramco is its dominance over the global oil industry for the past 70 years. You see, the company provides more than 10% of the world's oil supply every single day. 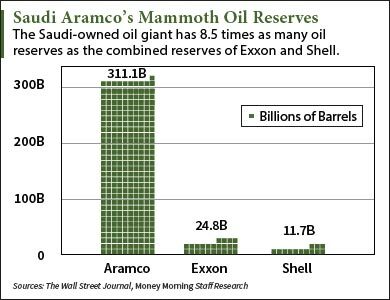 One of the few financial details Aramco reveals to the public is its oil reserves – 311.10 billion barrels. That dwarfs the 24.8 billion barrels currently owned by Exxon Mobil Corp. (NYSE: XOM) – the biggest independent energy corporation in the world. Despite the tremendous oil reserves, the Saudi Aramco IPO is a big part of the country's plan to wean its economy off oil revenue. The projected $150 billion in proceeds from the deal would give Saudi Arabia the necessary funds to boost non-oil economic programs. These include energy subsidies for oil workers and a green card-like program. Oil has constituted 80% of the country's total revenue for eight decades. That makes this economic reform – called Saudi Vision 2030 – a historic move for the kingdom's position in the global energy market. Alex McGuire writes about the energy market and IPOs for Money Morning. Follow him on Twitter for the biggest news updates on the Saudi Aramco IPO. Yes it is true that under wraps oil fields are disclosed after IPO.